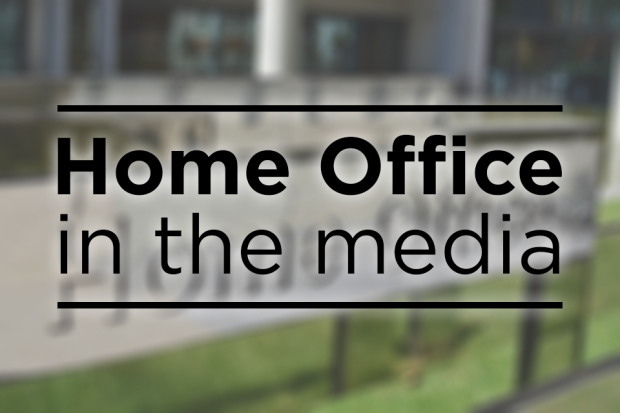 Today’s Home Office coverage of interest includes stories on yesterday's crime statistics, the appointment of Sara Khan as head of the Commission for Countering Extremism, and the first annual report from the Independent Reviewer of Terrorism Legislation. The Times, Mail and Guardian are among the publications that covered the new crime statistics, released yesterday by the Office of National Statistics and the Home Office. Some of the papers lead on the increase in police recorded violent crime, noting that it’s at its highest level in a decade. However they also highlight the Crime Survey for England and Wales, which showed a 10% drop in overall crime. Editorials are also carried in the Times, and Telegraph. The Times notes the Home Secretary’s article in the Red Box, where she promised a “step change” in how the government responds to crime, starting with a new “serious violence strategy” to be published in the spring. The Minister for Policing and Fire has issued the following response. The independent Office for National Statistics is clear that overall traditional crime is continuing to fall, and is now down by almost 40 per cent since 2010, while fraud and computer misuse - the most commonly experienced crime - has reduced by 15% in the past year. It is also welcome that the police’s recording of crime is improving, and that more victims of domestic abuse and sexual violence are feeling empowered to come forward. But we know that some of the increase in police-recorded violent offences is genuine which is why we have taken urgent action to stop these crimes. We will be announcing tough new laws to crack down on acid attacks and knife offences. And as crime changes, we will change our response - our forthcoming Serious Violence Strategy will place a new emphasis on steering young people away from a life of crime, while continuing to promote the strongest possible law enforcement response. The Times and Telegraph and Sun are among those reporting on the appointment of Sara Khan as the head of the new Commission for Countering Extremism. According to the Telegraph, Downing Street ‘was forced to defend the appointment’ following a petition signed by 100 Muslim organisations and scholars calling for Ms Khan to be removed from her role. The Sun carries a piece from Nikita Malik, Director of the Centre for the Response to Radicalisation and Terrorism at the Henry Jackson Society, which claims that Ms Khan is ‘perfect’ for the role. According to the piece, Ms Khan is ‘well qualified’ and because she is young, female and vocal she will “enable many more to speak up”. The Home Secretary’s response to the appointment can be found below. The Commission for Countering Extremism will form a crucial part of this government’s work to stop the scourge of extremism in all its forms and Sara Khan is expertly qualified to lead its important work. She will bring a wealth of experience and knowledge to the Commission which will prove vital as it works to identify and challenge extremism and provide independent advice to the government. Last century we challenged racism by uniting civil society and the state. We have the same ambition to confront extremism. This government will not stand by and allow the menace of extremism to undermine the fundamental, pluralistic values which underpin our society. The Telegraph and Mail are among those covering the first annual report published by the Independent Reviewer of Terrorism Legislation, Max Hill. The Telegraph leads on Mr Hill’s warning that Government policing of social media could push terrorists onto the dark web. The Mail highlights Hill’s claim that controlling social media could “interfere with basic freedoms”. Given the unprecedented terrorist threat, it is absolutely vital that our counter-terrorism laws are effective but also fair and proportionate. Our legislation gives the police and security services a range of powers to identify and disrupt terrorist activity. We are also making good progress in implementing the Investigatory Powers Act which creates world-leading oversight and safeguards governing the use of powers to identify terrorist and other criminal activity. We are considering Max Hill QC's recommendations carefully and will respond formally in due course. "Following the attacks last year, we are also reviewing our counter-terrorism strategy to ensure it keeps pace with the threat now and in the future.